As per astrology, this year is going to be really exciting for you, as it is filled with a lot of astonishments and amazement. The Taurus 2019 horoscope says that this year will be very fruitful for you and your dear ones because there lies a great possibility for you to get promoted at your job or obtain some good amount of profit through your business. Furthermore, students may also get a chance to go abroad, to pursue their higher education which will mark as a good opportunity for them to grow and get some exposure. Ganesha predicts, that your family life and matters affiliated to love will also bloom like a beautiful flower in a garden. According to the Taurus horoscope 2019, the year will be enjoyable, and you will be able to accomplish tasks related to your profession and some related to your personal ones, which were incomplete for some time now. An important aspect that you can put emphasis on, this Taurus life 2019 is, setting up of priorities and working on them accordingly. This is the best time where you can do some good planning and implement them in the most perfect manner to get the best out of yourself and the resources available to you. So, work hard, aim to give your hundred percent and the rest will follow, says Ganesha. You may as well notice, that you will have a great bonding with people around you as predicted in Taurus yearly horoscope 2019. It is advised for you to remain in touch with the reality around and not give in to false urges and desires this year. Even though the previous year was not a good one for you, this year will bring prosperity, happiness and you may encounter moments of bliss and pleasure. 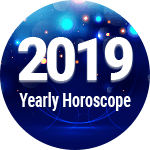 You had been through a lot the previous year, so this year is the time to make the most of it and enjoy to the fullest as per yearly astrology for 2019 Taurus horoscope. You may involve yourself in a lot of other activities in your free time, like partying, travelling and other pastimes filled with entertainment and excitement as well. Some of you may be able to amalgamate your joyful activities with your job, says Taurus in 2019. This year, the concurrence of ketu, Saturn and Jupiter in the Sagittarius sign will take place in the 8th House, informs Ganesha. This will create a drastic change in your personal as well as professional life in a positive direction according to the Taurus 2019 horoscope. This blend of the planets will have a very optimistic influence on you as you can expect a lot of surprises, sudden financial profit and bundles of great opportunities. This is not the end, as you may also find meaning in new relationships with people around you, build a good intuitive mind and acquire wealth like never before. You will also indulge in property dealings which will yield you good benefits, as far as your wealth is concerned. So, with such strong Taurus 2019 predictions, this year will bring a lot more opportunities, freedom and joy to you and your family. Taurus Horoscope 2019 Overall rating: 4.6 out of 55 based on 1324 reviews.